A wonderful movie that takes us through the origins of the band and some of their more popular songs, while also telling a powerful story. This is the movie about the band Queen, that has been in the works for ages. This group has s fantastic story, involving loyalty, drugs, and betrayal. And it comes through here in some very powerful ways. But the movie also dies something very smart, in that it tells the story of how a number of songs originated. Songs like Bohemian Rhapsody, We Will Rock You, and Another One Bites The Dust. 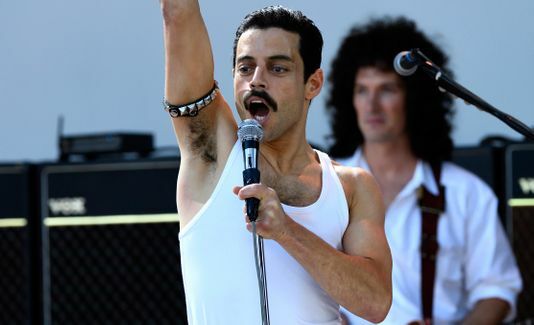 Combine all of they with a knockout performance by Rami Malik in his portrayal of Freddy Mercury, and you’ve got one hell of a film. 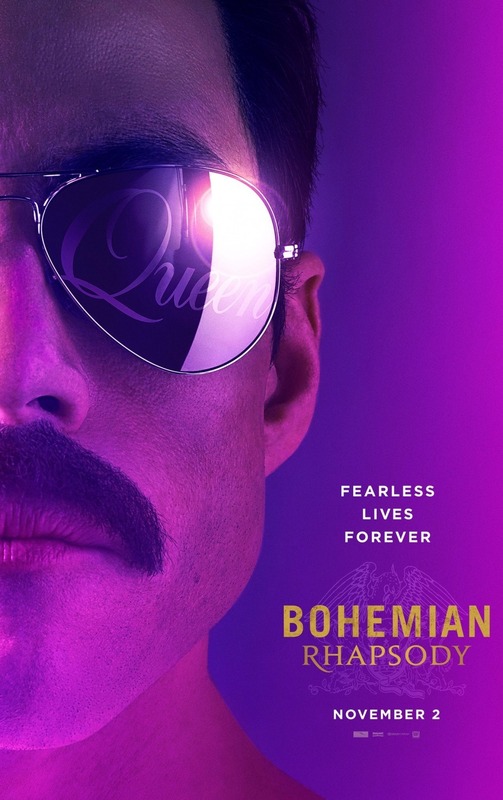 Bohemian Rhapsody is the movie we were all hoping for. It’s the movie we’ve been waiting for. And I mean for a long, long time. Ever since Sasha Baron Cohen hit it big in movies, taking his HBO Ali G Show persona to the big screen with movies like Borat, Cohen has been talking about making this film. And the irony is that about a two years ago, he parted ways with the project. But we still knew it was out there, just waiting to get made. And now, seeing how great the movie is, and what actor Rami Malick was able to do with the role, it clearly was the right move to go with him over Cohen. Especially when hearing that Cohen was going for more of a comedy about the scandalous life of Freddy Mercury, and Bohemian Rhapsody is most certainly not that. It’s a drama, and a damn good and emotional one. This is the story of Freddy Mercury, a guy who refused to sell out his bandmates and go it on his own until there were so many forces pushing him in that direction that he felt he had no other choice. When we think of Mercury, we think of this flamboyant ID persona who did whatever he wanted and never looked back. Not so, based on this movie. Mercury wasn’t a guy who married a woman, knowing full-well that he was gay, because he just didn’t care. He’s a guy who fell in love with the personality of this woman and considered her his best friend, only to realize that he couldn’t control his sexual feelings, no matter how hard he tried. At a certain point in this movie, even his wife, Mary, has to tell him that clearly he’s gay, and that she’s okay with it, so long as he stops hiding from the truth. That’s how much in denial this guy was. But the relationships in coming out of the closet situation are only a small part of this film. Mostly, the movie is about the music, and what a great band and amount of music there is to show us. We get stories of how it all went down, from the early days to seeing how each individual song came together. 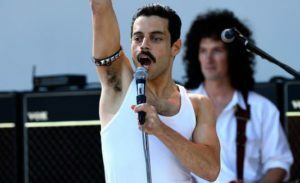 There are three songs in particular that we get to see being put together from scratch… Bohemian Rhapsody, We Will Rock You, and Another One Bites the Dust. Now, consider for just a moment that the best part of the Val Kilmer Oliver Stone movie The Doors, was when we got to see the band putting together the song Light My Fire. And now realize that with Bohemian Rhapsody, the movie triples that, giving us the construction of three songs. It’s pretty amazing. Malick really is terrific here, playing Mercury. He’s a guy who seems so wrong for being the front man of a popular band, and yet turned out to be so right for it. The movie starts with him as a young man, dealing with his Indian parents who are very traditional. Mercury rebels against them and goes to a club where he sees this great band perform live. And he approaches the band in the parking lot, after their set, to let them now how fantastic they sounded. Only they’re not too thrilled with his compliment, since they just lost their front man, who quit the group right after the show. That’s when Mercury chimes in, telling the two remaining members that they’re in luck, since he can fill the front man’s shoes. They laugh at him, of course, saying he just doesn’t look the part at all. Especially not with those two giant buck teeth he has going for him. And that’s when Mercury calmly explains that he was born with some extra teeth, which just means his mouth is bigger than most people’s and can open wider, and that means he can belt out higher and longer notes than most men. Mercury then goes on to sing a bit and show the guys what he’s talking about. And just like that, he’s in. Only the band doesn’t have immediate success. They play at the club, and are popular, but it still takes a while for them to get the public’s attention. Eventually some managers, come to see him. The head manager is played by Aidan Gillen, (so good on both The Wire and Game of Thrones.) He wants to sign Mercury and his group, Queen, to a deal, and the group agrees. And so they start putting out records and everything is going smooth until they come up with the song Bohemian Rhapsody. That’s when their producer, Ray Foster (Mike Meyers,) wants to see him. He looks like roast master Jeff Ross here, all done up in hair and a beard that make Meyers nearly unrecognizable, but once you hear him speak, there’s no denying it’s him. And what’s so special about this, of course, is the connection between Meyers and Queen. You see, it was Mike Meyers and his movie Wayne’s World which brought Queen back to the public’s attention with their lip-synching car ride scene to the song Bohemian Rhapsody. So it’s pretty great that Meyers is not only in this movie, but doing a scene about Bohemian Rhapsody too. And his being negative about the song, in this movie, leads to some pretty funny moments and lines. Now, for everything this movie has going on musically, it also has a pretty powerful and emotional story as well. Especially in the second half. There’s a point where Freddy separates from the group and gets taken advsntage of by his manager. Then Freddy is visited by an old friend, in an outside in the rain scene, that really puts everything into perspective for him. He’s in a bad place, and he needs to get out of there fast, by literally running away from the joy/3 and into the rain. This scene, and the one that follows, where Freddy confronts his band mates, are both fantastic and emotional as hell. And it all leads to the concert at the end. This is Live Aid, a charity concert that is seen around the world. And we get to see Queens entire set. That means a whole bunch of songs, from Bohemian Rhapsody to We Will Rock You to We Are The Champions. Every one of these numbers is fantastic. The concert is a great way to end the movie, filled with energy and full versions of each song. Bohemian Rhapsody is a little gem of a movie. It’s the film about Queen that took all of these long years to make. It’s also the story of Freddy Mercury and his wonderfully tragic life. Rami Malik knocks it out if the park with this role. And what’s really special is that the story is so powerful. The movie is smart enough to show us the origins of some of the more popular songs, but it is also smart enough to give us a story that sort of breaks the mold. We’re used to seeing the popular bands front man go his separate way from the group, but we’re not used to seeing how much Freddy Mercury resisted that, and what a toll it took on him. This is an unconventional telling if the story, and it was absolutely fantastic.